Over the years Lexmoto has picked up numerous awards. In 2017, Auto Trader gave the award for the Best 50cc Bike to the Lexmoto Echo, which has gone on to be one of the UKs biggest selling scooters. We have won the British Dealer News award for Franchise of the Year 3 times. 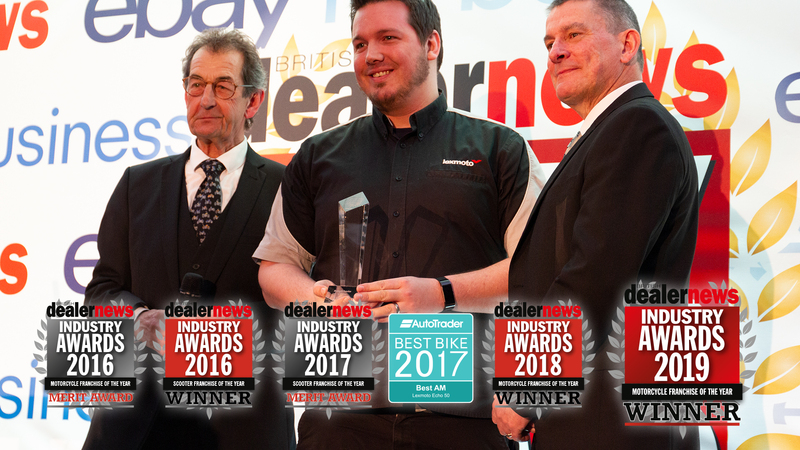 1 year for Scooter Franchise of the Year in 2016 and a merit award for 2017 plus, we have won 2 years in a row for Motorcycle Franchise of the Year in 2018 and 2019 with a merit award in 2016. This means that UK dealers recognize Lexmoto motorcycles and scooters as the best franchise to work with in the learner legal market. Great products, competitive pricing and solid after sales backup, Lexmoto aim to offer the best possible experience to our dealers and ultimately, Lexmoto customers.